"Moxie" is a dictionary approved word that spellcheck recognizes. The word is named after the drink. Apparently if you're on the "love it" side of the "love it"/"hate it" divide then when you drink a sufficient amount . . . that's where the word "moxie" comes from. I can't speak to the accuracy of that because the only time I tried some I immediately spit it out on the pine needle covered ground. 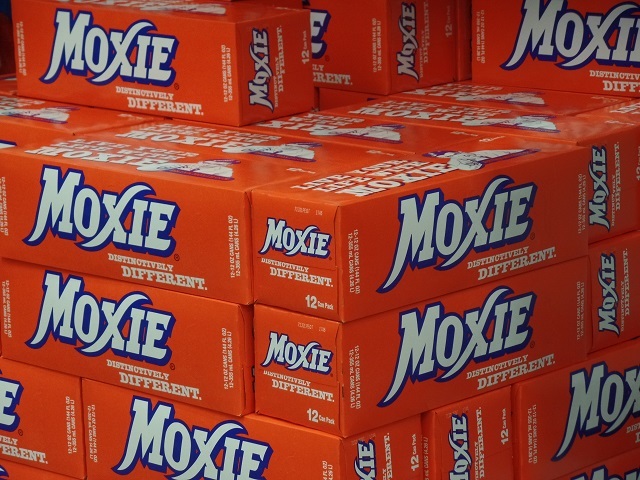 Moxie isn't actually from Maine, its creator was, but he made it in Mass and the company is currently headquartered in New Hampshire, but for some reason it's strongly associated with Maine and thus when I saw a giant pile of Moxie boxes while standing around in Maine, it felt kind of appropriate, locationally speaking.